A thriller more than the biography of "the first Polish officer in NATO", and an action film more than a tedious reconstruction of facts. Pasikowski's long-awaited story about Colonel Kukliński isn't flawless, but it keeps you in suspense. In 1972, he was one of the most respected officers of the Polish Army. A young Colonel, who four years earlier devised Poland's plans to intervene in Czechoslovakia, he was clearly favoured by General Jaruzelski. He was also liked by his Soviet superiors who saw him as the hope of the Polish Army. Nine years later, he became their greatest enemy. When secret documents about a USSR-planned atomic war came into his hands, the Colonel decided to cooperate with the CIA and reveal the plans to the Americans. Thus he became an enemy of the communist regime and one of the most important actors of the drama that was the Cold War. To tell the story of Kukliński, Władysław Pasikowski puts the spy thriller genre to use. Jack Strong makes no failed attempts at being a biography of the Colonel, or a portrait of the realities of the era. It's a thriller with one guiding principle: keep the suspense. And that he does. Jack Strong is sculpted by a rhythm-conscious director who is in control of the tempo of the upcoming scenes. Against the classical spy story template - Pasikowski talks about a converted hero who abandons the "evil empire" to save his homeland. Forced to lead a double life, he sentences himself to loneliness: on the one hand he renounces his loyalty for his communist superiors, and on the other, he can't reveal his involvement with espionage even to his family. Pasikowski, a specialist in "masculine cinema", has experience in drawing portraits of male characters. Those in this film include a couple of submissive villains (played by Baka and Zamachowski), a noble soldier who decides to betray the party and a brave American agent (Patrick Wilson). Then there is Rakowiecki (a great performance by Ireneusz Czop), Kukliński's old comrade who takes part in repressing strikes and then dwells in an endless cycle of drinking to forget. In portraying these men, Pasikowski gives up on viewing the world in black and white. He doesn't damn the communist officials, seeing them as Soviet marionettes, nor does he use film as a way to pay them tribute. His Kukliński is a superhero full of doubts, a tough and courageous man, but not an invincible action hero. The male characters in Jack Strong are varied and pronounced, but unfortunately, the same cannot be said of the females. In Pasikowski's universe, even the protagonist's wife (played by Maja Ostaszewska) was conceived as an accessory for her famous husband. Her only display of real emotion is when she has a fit of jealousy over her spouse's alleged lover. The creators of Jack Strong often refer to the classics of the spy genre. Magdalena Górka's grainy photography of the interiors of the party cabinets is reminiscent of Tomas Alfredson 's Tinker, Tailor, Soldier, Spy based on John le Carré's book. But there is still a world of difference between Pasikowski and that particular Cold War thriller. Instead of thickening the atmosphere of anxiety, the director of Psy / Pigs takes his chances on an action film. There's a paradox with Jack Strong. The film's creators don't fully stand behind their story, while constantly underlining the actions of Colonel Kukliński on the screen. During meetings of the military, Kukliński is compared to Oleg Pieńkowski, a Soviet spy, who was throw into an industrial furnace for treason against the USSR, and when the Colonal is photocopying a couple of hundred pages the names that pop out straight away are Wałęsa, Mazowiecki, Wujec, Jacek Kuroń - the most important anticommunist activists. It seems that the creators must think that the story wouldn't be able to stand up on its own, without the interference of political authorities. 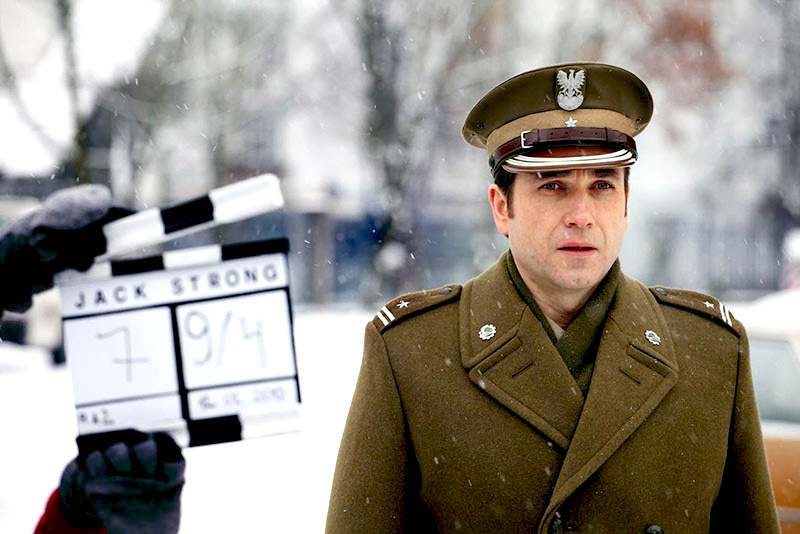 Jack Strong may not be flawless, but it shows that Pasikowski is an expert at his chosen genre. After Pokłosie / Aftermath, in which the cinematic form was marginalised because of the debate that the subject spurred in Poland, this time, the director trusted the outlines of the genre and created a two hour thriller which doesn't take on a preaching tone. Read an interview with Pasikowski. "Jack Strong", Script and directing: Władysław Pasikowski, cinematography: Magdalena Górka, editing: Jarosław Kamiński, Cast: Marcin Dorociński, Maja Ostaszewska, Ireneusz Czop, Mirosław Baka, Zbigniew Zamachowski, Patrick Wilson, Krzysztof Pieczyński, Dagmara Dominczyk. Distributed by Vue Movie Distribution. Coming out in Poland on the 7th of Febuary 2014.